Several weeks ago, as I was getting ready for a vacation in Turkey, I made a dress to wear there. A prototype of sorts as I want to turn this into my go-to dress pattern. The base for this pattern is Burda WOF 03/2002 #125, which I had made several years ago but then lost the adjusted pattern in one of our numerous moves. The original pattern features raglan seams (omitted), long sleeves (shortened), waist darts in the back (omitted), and a large wide cowl-like collar (adjusted to a sleeker, narrower foldover style). I added a self-fabric belt that is long enough to wrap around twice, and pegged the hem for a more flattering look. Sleeve length here is inspired by Butterick 5247. I simply measured from the neck point over the shoulder to almost the elbow and transferred that measurement to the pattern. It worked out really well – I will continue to use this length. When I used this pattern previously, it was for a winter dress and I had adjusted the collar to be more like a loose turtleneck. This time, for a more summery look, I dropped the front neckline several inches. I like it very much. I would also like to try this neckline without the collar, perhaps narrowed by a half inch from each side, to wear with scarves. I was looking for a drapey summer-weight knit like Sophia but there was none in my limited stash. I decided to use a beefy wool doubleknit, which actually makes this a three-season dress rather than a summer dress. This is a very comfortable dress and the pattern is easy to sew, so there will be more versions of it in the future. 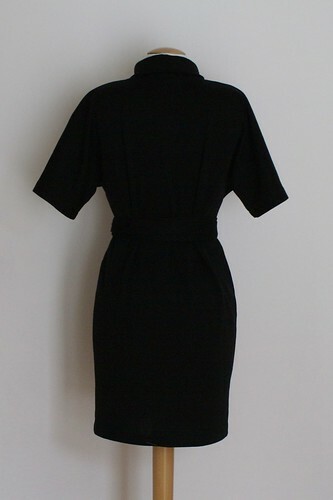 Very nice, a dress you can wear for many occasions, and looks like you can dress up or dress down.